Nineteen government officials from China explored smart cities technology during a recent three-week training program arranged by the Carl Vinson Institute of Government. Members of a delegation from the Shanghai Administration Institute (SAI), a training center for Chinese government officials, studied smart city initiatives during class sessions and site visits in Athens, Atlanta and New York City. So-called smart cities employ technology to reduce energy consumption and pollution, make transportation more efficient, attract businesses and visitors, and enhance a community’s quality of life. Faculty members with the Institute of Government and other University of Georgia schools and colleges, as well as local government officials and business leaders, led educational sessions for the SAI delegation. Topics ranged from smart home technology to ways cities are using technical innovations to address issues such as transportation flow, waste disposal and recycling. 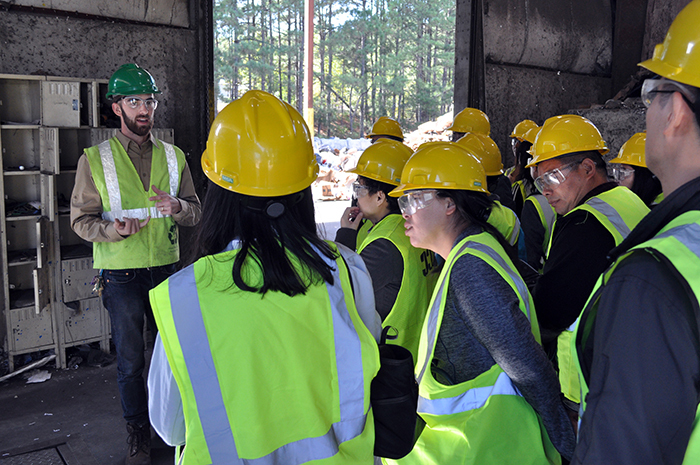 Delegation members visited the Athens-Clarke County Recovered Materials Processing Facility to see smart technology in action, as magnets and air jets separated food cans and plastic containers from a speeding conveyor of mixed recyclables that included paper, glass and aluminum. In addition, SAI delegation members learned how smart cities technology is affecting urban planning, public administration and economic revitalization efforts. SAI is the Institute of Government’s oldest international training partner, starting in 1998 when the Institute established its International Center. The Institute has provided educational sessions for SAI members almost every year since then. The collaboration is likely to continue: Five senior SAI officials will visit the Institute in December to explore future collaborations and discuss training programs related to leadership development, emergency management, infrastructure and other topics.